Congratulations- much happiness for you and the expanding family! Congratulations! Hope mom and Mortesv junior are doing well.We expect you to NOT post for at least a week! Selfishly, I'm kind of glad that the latest LDD is on hold. I'm struggling to one transport complete! Still waiting for one order to invoice on the Neb. Btw, the model is 120 cm - which is close to 48 inches - at least with my latests modifications. I saw that some of the engines needed to be a bit longer and I have elongated certain aspects of the front and the "sword", including a proper front canon :) I will post pictures soon. Do you want some help on that LDD? Congratulations mortesv, that's brilliant news! As promised here are some pictures. Several of the front pods have been elongated with one stud and the nose has been redesigned slightly. It no longer has the weird antenna in front, but a proper cannon looking protrusion. Still waiting for my bricks to reach the southern hemisphere! This one, built by member Dranac, is swooshable. Still has a pretty high piece count though. Rebel Capital ships a pretty boring compared to the good old star destroyer. 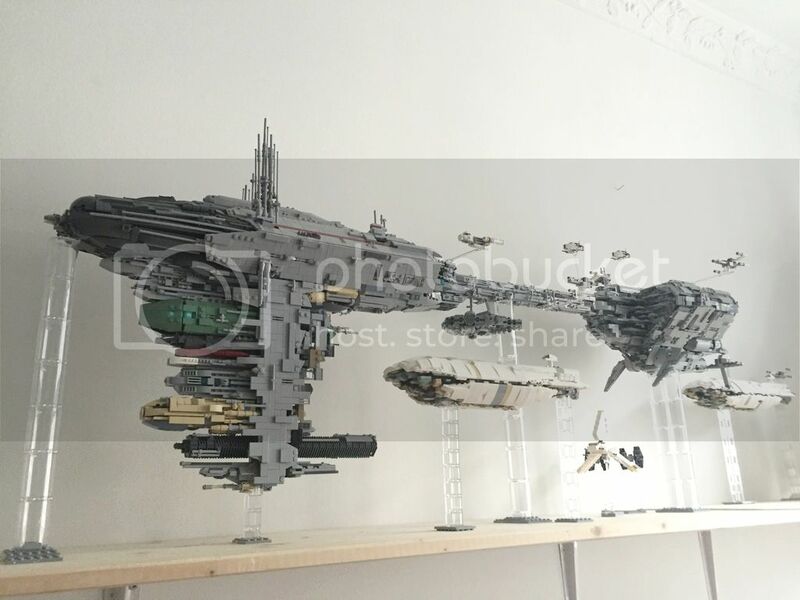 There is this one on ideas - it is a few years old, but it is an excellent looking UCS/play set! The current record can stand for as long as it wants to because I am a really slow builder. 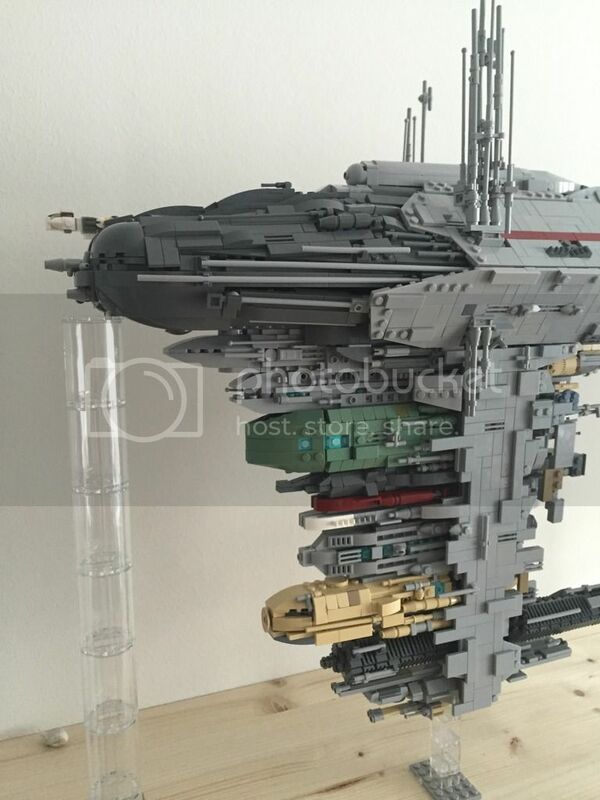 Case in point: My Venator (5,400+ bricks) took me close to a month to build because I could only grab 2 hours a day or so, to build that monster! Guess I have to find a really big table to sort them bricks! You should have seen my Lego room when I built my Zenith! Commandeering the pool table! No one is playing pool until the Nebulon is done!!! Yes, lots of tables needed! However the best feeling is rearranging pieces abould halfway through and getting rid of a table. I had made small paths guests could use when they came over. However the guests quickly grew tired of being commandeered around the room to fetch bricks. That would have been quite hilarious for you but not so your guests I believe! Too bad I can't contribute to this thread yet, since I don't have my bricks yet!!!! Sadly, I do not have the luxury of a Lego room, so I have to set up and remove the build every evening I'm working on it again. Thus, I could only kind of pre-sort the parts into different bags, and stuff proceeds slowly. Doesn't matter, having tons of fun :). I rearranged build order a bit since I did not have all parts when I started - essentially skipped the top section, turned the model on the back and will finish the bottom before I will put it on the stands. Hope this will work out. Otherwise, everything went smoothly with the manual until I had to put in the two small blue technic liftarms visible on the left here. This turned out to be completely impossible given the current state of the build (you might get an idea about the chicken-and-egg-problem from the picture). I had to basically tear apart half of the back section again and found only one build order which works, and it was not that from the manual ;). No idea how other people managed this so far. Not complaining myself, I enjoyed the challenge, but if you ever touch the manual again you might want to reorder the build so that it is actually physically possible. Anyway, I'd like to report one error in the parts list and maybe warn other builders. 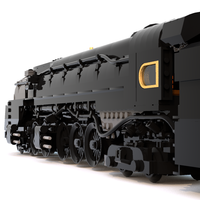 The little subsection built on manual pages 145-149 is NOT in the LDD file, and the parts are as far as I can see also missing from the parts list. I did a careful inventory and definitely have everything from the parts list, but for this very small section two of the necessary slopes are now missing for me. It is extremely unlikely that this can be attributed to chance. Second little error, very easy to spot but might also transfer to the parts list as it's also wrong in LDD: on page 165 one should insert a double-sided pin so that one can actually attach this subsection to the main model. Thanks again for your efforts in publishing this, it's wonderful to see the model grow and from LDD without the instructions it would be a nightmare to build it ;). Finally managed to finish the bottom and turned it the right way around and on the stands (I think it's possible on your own, but definitely vastly easier with help). In the end, this order of building the Nebulon worked out quite well - you have to fiddle around a lot to get all the pods into place, and I was very happy that the model rested very securely on the back side. Now that it's on the stands, it feels a bit wobbly, although I think there is no real risk of it falling over - you need to apply quite a bit of lateral force to topple it. Still, I'm thinking about gluing the stands onto a heavy wooden plate to make it feel more stable. Not that I live in an earthquake area, but you never know ;). One thing I would like to clear up is the height of the stands - I wonder what is really necessary here, as I do not want to have unnecessary strain on the model. When I tried to build the pillars according to manual, the front one was not tall enough - it carried no weight at all, and the front was sagging downwards. I had to add two plates to the front pillar and remove one from the small stand below the pods - now it at least looks straight at first glance, and the weight seems to be evenly distributed. Might change when everything settles down though. Should be about two-thirds done now, didn't count hours but it was vastly slower than the record ;). Regarding the height of the stands, please double check the ldd file. I think those have the correct height, but I think the instructions should match as well - but please double check. Oops, now that I checked LDD and compared, I noticed that I made a mistake at the front section, which caused the correct attachment point of the pillar to be covered by the slopes. I was already very much in doubt if it's intended that the model just rests on it without any real connection. Hope I can fix it without having to tear too much apart again. The current resting place is just temporary to keep it out of the way of everyday life - for further assembly, it will be of course moved somewhere more accessible ;). Sorry to hear you're having to "part" with your build so soon. Hope everything works out for you! It is a pity that you have to sell your build, Cjd223! I hope the person that buys it over will treasure it as much as we all do and that you get to solve whatever issue that you may have had that forced you to sell.